When Professor Kathie Jenni first created the May Term course Taking Animals Seriously more than two decades ago, national interest in the topic was growing, and students at the U of R were eager for animal-related service work and scholarship. The one-month course combined an animal ethics class with a hands-on internship at Best Friends Animal Sanctuary in southern Utah. From the beginning, demand quickly exceeded course capacity. That demand and Jenni’s commitment ultimately led to the interdisciplinary human-animal studies (HAST) minor in the College of Arts and Sciences—this year celebrating a decade of scholarship, service, and outreach. Taylor Dee ’15 puts what she learned to work as a field and wildlife biologist for an environmental consulting company. She says the minor made her aware of issues such as the high volume of domestic animals without homes and human-wildlife conflict. Studying abroad in East Africa, the class discussed the ways wildlife was impacting people’s livelihoods. There, issues involved crop raiding (often by elephants) and loss of livestock via predators such as lions or hyenas. “The HAST program taught me to be open-minded and that many issues are dynamic and not as simple as we'd like them to be,” Dee says. 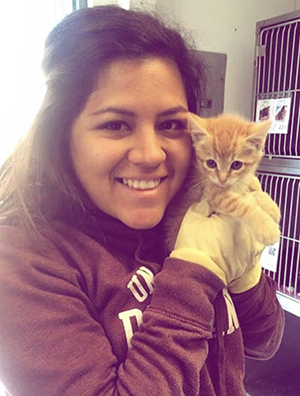 Lexi Calderon ’16 helps socialize a kitten. Professor Catherine Salmon, whose evolutionary psychology course contributes to the minor, believes the program, which is among only a few of its kind in the United States, is important. “Animal rights in research, factory farming, the plight of endangered species, and how we co-exist with the other residents of our planet are all critical issues,” says Salmon, a HAST advisor. To learn more about the human-animal studies minor at the University of Redlands, visit the HAST web page.